Garden edging can not only define your garden area and give it structure during the winter months, it can also show off your personality as well. The possibilities are endless! Just lay a strip of landscape fabric underneath before you start to save yourself from future weeding nightmares - you definitely don’t want to end up removing a section of your hard work just to weed it and then replace it again! Living on the North Fork of Long Island, this might be a popular choice! It’s perfect for a beach themed home or just for those who love that coastal feel. Bury the shells half way own to keep them in place with the soil and make sure they are facing away from you for the best effect. The bigger the shell the better. 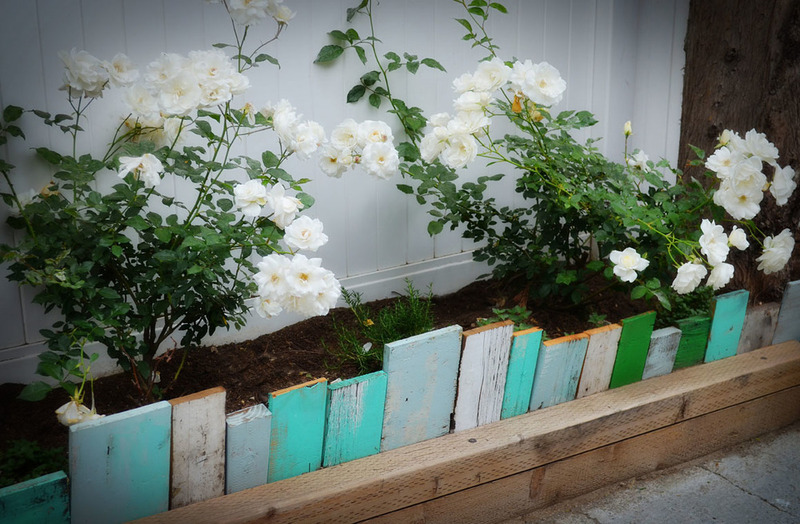 Use leftover roof tiles as garden edging. These tiles are secured by old builders block or recycled concrete chunks behind the bottom edge of the tiles, then soil. Perhaps you could scout out broken tiles from a local builder and get them for free for hauling them off site. Great re-purposed project! Using old bamboo fence rolls and cut into smaller sections. This can have a very contemporary look. Secure it with stakes every foot or two,. I love this look! Here are easy instructions for this project. An edging that is both living and sturdy! Plant Sedums in every building block, or you could skip a few. You can use the same plant throughout the whole edging system, use different colors if you’d like or different varieties of the same plant to add some personality! This idea is best in areas where there is little traffic from machinery such as mowers. You can bury the bottles neck down so that the bottoms of the bottles provide the edging. You can vary the heights of each bottle, or keep it all uniform. Choose to use bottles of all one color, or mix it up. These can also offer some support to the plants at they grow in height. This is so cute! Start scouting out the yards sales! Creative, funky and quirky. Know of any junk yards you could check out? I can see myself having a lot of fun with this one! Grow a collection from yard sales, thrift stores, or by posting a want ad on Freecycle or a community bulletin board. Use the dishes whole, and dig into the ground as a border. Or break the dishes and use in a trench much the same as you would small decorative stone. Place a few dishes at a time into an old pillowcase to protect you from flying glass, wear safety glasses, and take your hammer to it! How small of pieces you want is totally up to you. Keep the size in scale with the size of the trench and garden area. Also remember, larger pieces will give you more texture and color. Recycled industrial materials blend well into the natural state of the garden and have a modern look. Check out your local Habitat for Humanity Re-Store, or yard sales and salvage stores for great ideas. Remember, you can use things that can be partially buried in the ground, like steel pipe sections, or perhaps steel utility boxes or slices of PVC pipe that can be laid into trenches, then back filled with gravel. This is a common one, I know. But it’s tried and true! Give the old fashioned look an update and dig a trench edging your garden and fill is with smaller rocks and stones. You could buy decorative rocks or collect smaller rocks from your own yard. With a little added color this is so shabby chic! Pallets seem to be the new DIY material for almost everything. It’s a renewable resource, that is usually free! Check Craigslist or ask local businesses for their leftover wood pallets. Use the lumber to cut sections of wood, paint some of them randomly and sloppily with leftover house paint and leave some unfinished, then dig into a trench along your garden edge. Any other scrap wood can be used as well.